The New Rules of Golf Apparel: Golf is a Game. Apparel is a Medium. Style is an Art. As we all wait for the year’s first major to roll in, the hottest subject in golf seems to be the recent rule changes that became effective January 1st. It is now late March, and we still cannot go a week without talking about the rules whether it be an infraction seen on tour or general clarification to help educate the weekend amateur. Despite early confusion and challenges, I imagine the original intent was to improve and benefit the game - “let’s makes some changes and evolve the game to make it both more enjoyable and accessible to current lifestyles.” As a business owner in the apparel side of the industry, it got me thinking about how this relates to us in 2019. More so, a discussion regarding the rules of golf apparel or “golf style” may be both timely and interesting. Apparel influences golf more so than any other sport in the world - both in business and in competition. According to the 2019 World Golf Report, golf apparel reached $5 billion in sales in 2018 and accounted for roughly 40% of all retail sales in the industry. Not bad. Apparel plays a major role inside the game as well. Players strategize and select outfits daily based on factors like weather, temperature, mood, fashion trends and even superstitions such as specific days of the week (i.e. Sunday). Marketing pitches everywhere now include how this shirt or pant or shoe or underwear can “help you perform better.” You have heard them. Apparel and footwear have seemingly become the 15th and possibly 16th club. Given that what we wear is such an integral part of the game, shouldn’t we be looking at apparel with the same perspective - how can its rules evolve such that we continue to increase the game’s growth and enjoyment for all? I recently researched the following subjects: “rules of golf apparel 2019,” “modern golf style,” “2019 golf dress code” and other versions of the same sort. Much of what I found included recent articles from major publications with a very consistent message: the do’s and do not’s of golf style. “Do this and this” - you will fit in and look good. “Don’t do this and this” - you probably will not fit in and may not even be able to play via dress code. Details about sleeve length, sleeve type, short length, short type, pocket length, pocket type and collar type dominated most discussions. These were not fashion editorial articles. They were guidelines for conformity. The clear message was to define what golf apparel is and how to fit in. Isn’t the individuality of golf its most unique and cherished characteristic? Let’s think about this. Whenever apparel is confined by a set of rules or guidelines, it is typically reclassified as “uniforms.” We see this in other sports as well as schools and businesses on occasion. There is nothing bad about uniforms or dress codes. They often make life simpler and create more egalitarian settings or environments. However, there is a standardization that occurs with uniforms in which creativity, personality and sense of self are diminished. In other words, they limit you being you and put a cap on fun. This is often overlooked as “fun” is not a top priority for most institutions with uniforms or dress codes. Golf at its most basic core, however, is a game. Why would we want to limit the level of fun in any game? Plus, isn’t the individuality of golf its most unique and cherished characteristic? There are no teams, it is you versus the course, you keep your own score, you call your own rules, etc. We should be accentuating the individual aspects of the game, not confining them. So, is the golf apparel industry selling apparel or uniforms? I would argue that from both a fashion and business perspective, we are putting a ceiling to the industry’s potential? No successful fashion designer in history has embraced uniformity, and while respecting the game’s tradition, we should also remember that modern golf dress code was established in a completely different era. People naturally dressed more formally in the 1950s. The need for golf dress code at the time had not presented itself. Some of today’s casual lifestyle looks such as denim or leggings were years away from hitting mainstream. Dress codes were later implemented to deter these casual trends from entering the golf course or club. But why? I could argue that “making casual look good” has been a global trend for some time and is the essence of modern style. A clean white t-shirt and faded jeans has been the focal point for some of the most successful ad campaigns ever (Calvin Klein, Pepsi, Polo Ralph Lauren, and Abercrombie & Fitch). A success that directly comes from likability and connecting to a large audience. People and cultures have evolved. How much does golf care to evolve with? If golf apparel had no rules and embraced the entirety of the fashion spectrum, what could that $5 billion in sales become? Another concept I find interesting is the term “golf fashion” or “golf style.” Many of us frequently put these words together while failing to recognize the inherent irony. The rules of golf are endless whereas style has no rules. Like uniforms are to fashion, golf is to style as cage is to bird. Style is a widely likable and unconfined trait. It can be seen in anything or anybody. Conversely, rules are widely unlikable and confining by definition. Think of the most stylish men or women in history. They did not follow the rules. Instead, they were commonly depicted as rebels and admired from breaking the rules. Take James Dean as an example. Can you imagine if James Dean had broken out on tour? What effect would that have had on golf? Then again, is there a reason why a James Dean never did break out on tour? In other words, is golf an environment that suffocates the “James Deans” of the world? If so, is this ok? As industry leaders, is this an aspect about golf we wish to continue? Apparel is unquestionably a conduit to untouched audiences and growth. The game’s history and traditions come with a lot of pride, strength and years behind them. Many may say that golf is not interested in recruiting the rebellious, rule-breaking type, and optics could tarnish. The opposite, however, could not be truer. Think about Arnold Palmer. An unquestionable golf legend, worldwide superstar and style icon that grew and benefitted the game more so than anyone in history. He portrayed many rebellious qualities with how he swung the club, connected with the gallery, dressed, smoked and socialized. He was his own self, created his own brand and was admired by millions. Mr. Palmer did not follow the rules. He wrote the rules. More so, think of other controversial golfers who gained worldwide popularity and went on to generate unprecedented sales for the industry (Tiger Woods, John Daly & Rickie Fowler being easy examples). They all noticeably went against the grain either visually or in their lifestyle in regards to the norms and traditions of golf. Nonconformity and rebellion draw eyeballs which in turn leads to interest and curiosity. Golf needs more of this, not less. Golf has provided me with a lifetime of invaluable memories and experiences. It gave me a college education and inspired me to create QED Style. However, I do think many of golf’s traditions and rules have created a stigma that limits its likability to those outside the industry. This is especially true for young people. Young people drive the future. They collectively determine what is cool, trendy and ultimately successful for industries all over the world. We should be looking at all opportunities to capture that audience. Apparel is one of these opportunities. Clothing is required in nearly every culture on earth, and fashion is recognized as one of the few universal languages in existence extending over thousands of years. According to the McKinsey Global Fashion Index, the fashion industry was worth an estimated $2.4 trillion in 2017. To give you perspective, that was more than double the pharmaceutical industry ($1.17 trillion). Apparel is unquestionably a conduit to untouched audiences and growth. Perhaps, even the next James Dean. We should be appreciating it as a medium that can showcase freedoms, personalities and cultures well beyond the traditional golf landscape. Style guides, dress codes and instructions on “how to dress” suffocate this unique ability. To which I ask, at what point does golf’s traditions supersede its future wellbeing? What is truly the game’s highest priority moving forward? Why would we weigh conformity over individuality in a game played by individuals? These are big-picture questions stretching beyond just apparel. However, if growth and inclusion are the slightest of priorities, many of the answers may seem fairly evident. Mike McRae is the founder of QED Style, an apparel company based out of Salt Lake City, Utah. He graduated from St. Mary’s College of California in 2008 in which he played four years of collegiate golf and earned NCAA Div. I All-American honors in 2008. After graduating, he turned professional and played on the Canadian, Asian and Web.com tours until 2013. In 2011, Mike started QED Style in hopes of building a golf apparel brand that embraced the more active lifestyle looks he grew up with in the mountains. 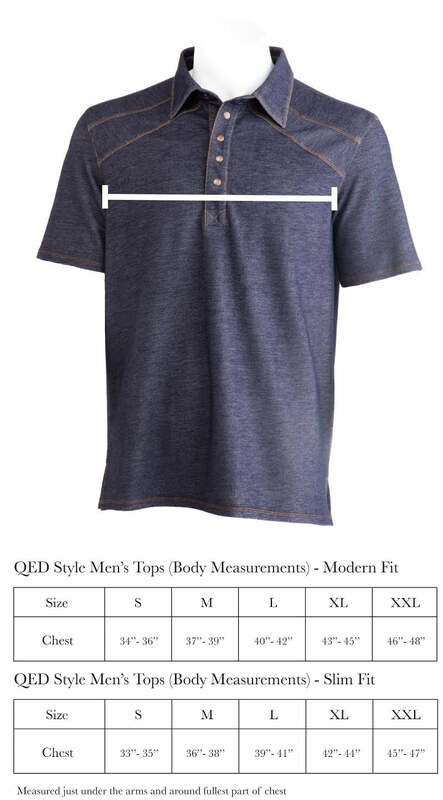 QED Style can be found in golf shops, resorts and small retailers across North America and is recognized through the industry as a boutique style apparel line that prides itself on its detailing and golfing roots. Did you know that QED Style offers corporate and tournament pricing for all of our apparel? If first impressions are as important as advertised, we could be your new best friend. QED Style has partnered with businesses large and small across the country interested in apparel that looks professional, stylish and comfortable. What has bubbly prints, a unique perspective on grass, snap button down dresses and an appreciation for cornflower? You guessed it. The QED Style Spring 2019 line. Despite it being 8 degrees here in Salt Lake, we are stating that spring has officially sprung. Introducing a new concept in 2019, the Paradise Shirt Series is a collection of printed shirts created using photographs of grasses commonly used on golf courses. For the golf enthusiasts, course superintendents, agronomists, botanists or anyone who seeks out beauty in something, we think you’ll enjoy this concept. As the year changes, we can be quick to get geared up and look ahead. While I am guilty of this as well, 2018 was a monumental year at QED Style. Growth, expansion, new account relationships, new vendor partnerships...even new a life?? Here is a list of our top ten moments from last year!